Tiago Splitter tipped in a rebound with 2.1 seconds left, lifting the short-handed San Antonio Spurs to a 104-102 victory over the Golden State Warriors on Thursday night. Stephen Curry hit a tying 3-pointer on the previous possession for the Warriors. 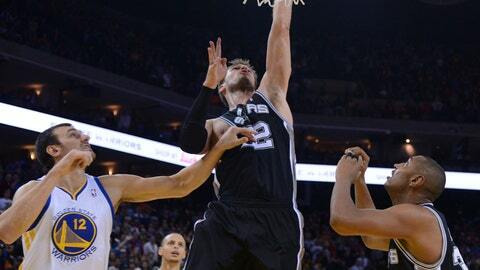 After two misses by teammates, Splitter elevated around the rim to tap in the winning score. San Antonio gave Tim Duncan and Manu Ginobili the night off to rest, and Tony Parker also sat out for the second straight game with a bruised right shin. The Spurs still managed to get the road win, using big nights from Marco Belinelli, Kawhi Leonard and Patty Mills to hand the Warriors another devastating defeat in a rematch of last season’s Western Conference semifinals.